The mother of a nine-year-old girl whose death may have been linked to air pollution has applied to the High Court for a new inquest. Rosamund Kissi-Debrah wants the original findings quashed after evidence linked the death of her child, Ella, to illegal levels of pollution near their home in Lewisham. Ella, nine, died in February 2013 after experiencing three years of seizures. During that time local air pollution levels breached EU legal limits. An inquest in 2014 concluded Ella's death was caused by acute respiratory failure and severe asthma. 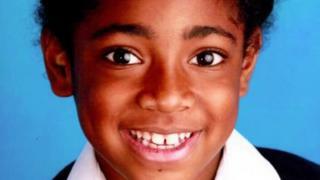 Speaking after an application at the Royal Courts of Justice was lodged on Friday, Ms Kissi-Debrah, said: "This is the latest step in finding out if it was air pollution that snatched my beautiful and bubbly daughter away from me. "While nothing will bring her back, I hope a new inquest will give me the answers I need." However, a recent report by asthma and air pollution expert Prof Stephen Holgate said there was a "striking association" between Ella's emergency hospital admissions and recorded spikes in nitrogen dioxide (NO2) and PM10s, the most noxious pollutants. His report said there was a "real prospect that without unlawful levels of air pollution, Ella would not have died". The Attorney General granted Ms Kissi-Debrah the right to apply to the High Court last month after the initial inquest failed to consider the impact of air pollution on her death. Ella, who had not been born with asthma, lived 25m (80ft) from London's South Circular Road - a notorious pollution "hotspot". She often walked to school along that road and Lewisham High Street. Ella was first taken to hospital in 2010 after a coughing fit that followed a spike in air pollution levels. She was subsequently admitted to hospital 27 times. Currently no individual death has been directly linked to air pollution.